Inspired by the classic film Forrest Gump, Bubba Gump Gatlinburg continues the tradition of a line of seafood restaurants that aims to provide a relaxed atmosphere where the whole family can have a great meal and a great time. As Bubba pointed out shrimp is the fruit of the sea, diners at Bubba Gump Shrimp Co. Gatlinburg can choose from the widest selection of shrimp dishes offered by any of the restaurants in Gatlinburg. Whatever flavor you desire Bubba Gump Gatlinburg probably has it. Appetizers at Bubba Gump Gatlinburg- Every good meal deserves a great start. 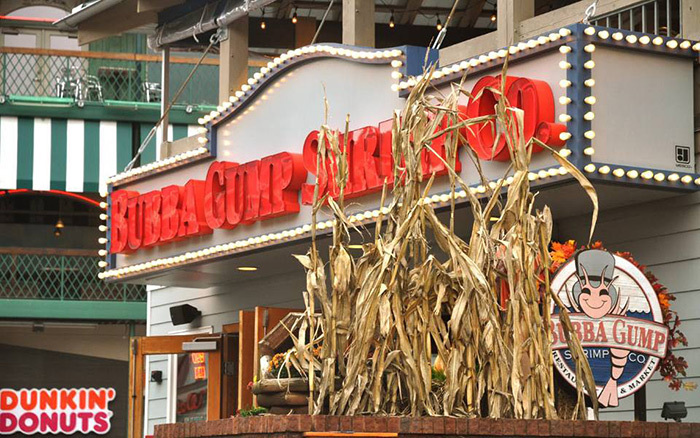 Enjoy shrimp cocktail, shrimp mac and cheese, cajun shrimp, and more at Bubba Gump Gatlinburg. Soups and Salads- Bubba Gump Co. Gatlinburg offers some of the finest Seafood Gumbo north of New Orleans as well as a delicious selection of salads, including the Pear & Berry salad. Sandwiches at Bubba Gump Gatlinburg- Don't pass on the chance to enjoy a Po' Boy or another delicious sandwich selection you won't find at the other restaurants in Gatlinburg. Shrimp Specialties- The reason everyone comes to Bubba Gump! Try the crab stuffed shrimp, fried shrimp, New Orleans shrimp, shrimp and grits, coconut shrimp, and, of course, shrimp scampi. Other Entrée's at Bubba Gump Gatlinburg- Have your fill of Cajun favorites such as jambalaya, fried chicken, and fish and chips. There's also steak fresh from Bubba Gump Co. Gatlinburg's grill and fresh catches from Forrest's boat Jenny waiting to be served. Bubba Gump Co. Gatlinburg Desserts- From Key Lime Pie to Strawberry Shortcake, these deserts will bring your meal at Bubba Gump Gatlinburg to an end. Enjoy a delicious meal at Bubba Gump Gatlinburg. Whatever you chose to eat it will be a meal not matched at other restaurants in Gatlinburg. While you eat, you and your friends and family will enjoy the entertainment and challenge as your waitress quizzing you on facts from the movie. Come enjoy Bubba Gump Co. Gatlinburg for an experience and shrimp selection unlike all the Gatlinburg seafood restaurants. Stay close to restaurants in Gatlinburg! Looking for Cabins near Gatlinburg? Check out our Gatlinburg Cabin Rentals. Everyone wants to stay close to all the restaurants in Gatlinburg, including Bubba Gump Gatlinburg. A stay at one of cabins places you minutes from downtown Gatlinburg's attractions and dining as well as provides you and your guests with ample space and all the comforts of home, which is sure to make this the most memorable Smoky Mountain vacation yet.